Public Health England is today launching a £2m campaign to "Keep antibiotics working" by discouraging people from using them when not necessary. The campaign comes alongside the publication of a paper, the English Surveillance Programme for Antimicrobial Utilisation and Resistance Report, which reveals the scale of the threat to human health posed by resistance to antibiotics. It is estimated at least 5,000 deaths are caused every year in England because antibiotics no longer work for some infections. This figure is set to rise as strains of bacteria emerge that are resistant to more antibiotics. A report last year predicted that by 2050, AMR (antimicrobial resistance) could kill 10 million people a year globally – more than currently die from cancer and diabetes combined. The campaign includes a musical, animated TV ad created by M&C Saatchi in which anthropomorphic pills explain through song the dangers of using antibiotics for minor complaints. The TV spot will be supported by radio, featuring the same tune, outdoor, print, social and in GP surgeries. The campaign will target those most likely to request antibiotics from their GP: older people, and parents who are responsible for their children’s medical care. The outdoor campaign is focused on sites close to pharmacies, while on Twitter, the campaign will target users by keyword, aiming to reach people who give indications of being mildly unwell. The campaign was created by Matt Collier and Wayne Robinson at M&C Saatchi, and the TV spot was directed by Noah Harris through Blink Productions, which did the animation. The music was composed and arranged by Alex Jonathan Crofton Ball and Eleanor Laura Wyatt. Media planning is being handled by MEC, media-buying by Carat, and PR by Freuds. Sheila Mitchell, marketing director at Public Health England, told Campaign the drive was about trying to move forward cultural attitudes towards antibiotics, but also providing "air cover" for GPs, who are often pressured into prescribing them when they are not necessary. "We can’t just say to people, you don’t really need antibiotics – we’ve still got to get them into the doctor," Mitchell said. People were becoming more familiar with the risks of AMR, she said, but changing behaviour meant appealing to them on an individual level. "Is there more intelligent coverage about it? Yes, absolutely. But is that landing with Mum on a Friday afternoon with a screaming child – not necessarily. We’ve got to appeal to the individual before the collective." The idea to have the message delivered by animated pills, meanwhile, came about as a result of a common response when the campaign was being tested. "When we started doing this, I thought the answer’s easy," Mitchell said. "A reassuring healthcare professional telling people about the dangers. But when we tested it, it was quite difficult territory – if it was a GP [delivering the message], that was being interpreted as part of NHS cost-cutting exercises." A trial run of the campaign, including TV, took place in north-west England earlier this year, and Mitchell said it had succeeded in not only raising awareness of the issue, but also causing a dip in prescriptions. Alongside the more conventional media, PHE has also created "treat your infection pads", an innovative product that bridges the gap between marketing asset and medical treatment. 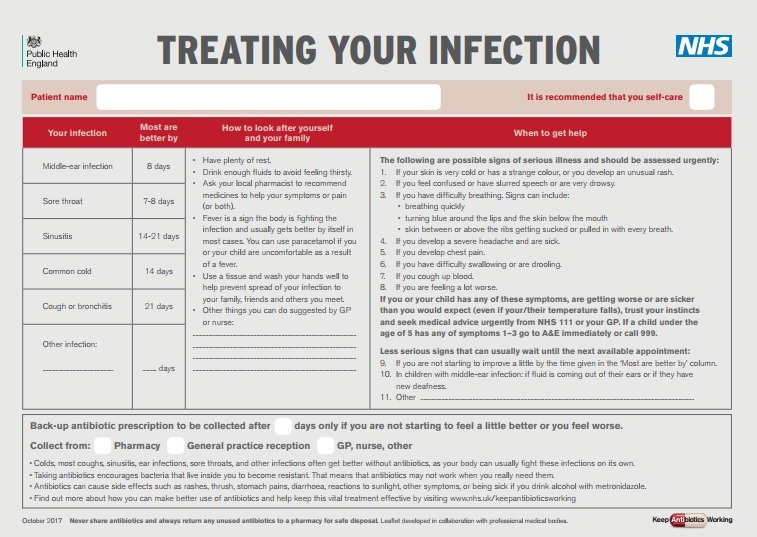 The sheets contain detailed information for patients on how to treat infections without antibiotics, and are designed to be handed out at the point the patient would be given a prescription. The idea came from the insight that people feel better if they leave the surgery having been given a piece of paper by their GP, Mitchell said. "To get that right into GP surgeries from a marketing world, that’s a really interesting test area for us."